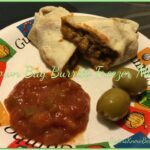 Beef and cheddar burritos that can be made ahead of time and frozen for a quick snack or a last minute dinner. Add remaining ingredients except for tortilla shells. Microwave 3-4 tortilla shells at a time for 20 seconds. This will make it easier to roll them. Spoon 1/4 cup of mixture in to each tortilla. An ice cream scoop works well for this. Roll up. Close ends in first and then roll. Wrap in paper towel. Then wrap in tinfoil. One burrito per paper towel and tinfoil. To serve: Remove aluminum foil. Microwave in paper towel for 1-3 minutes. Adding the green olives stuffed with garlic as a garnish was Bill’s idea. The side of salsa really made it a Mexican meal. What’s your favorite Mexican meal? 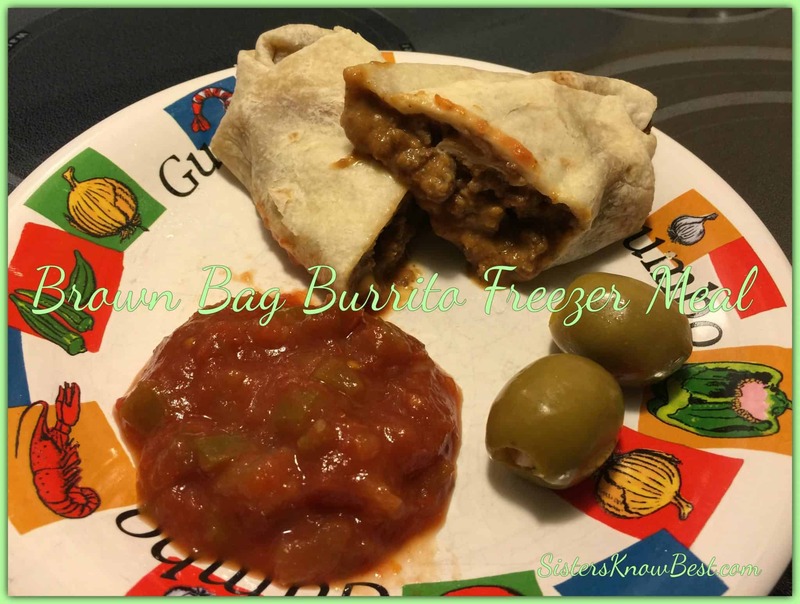 Don’t forget to check out our other meals in the Crockpot Freezer Meals Series.